Mount Kilimanjaro National Park is 128km from Arusha town, which covers an area of 755sq km (about 470sq miles), and Kilimanjaro is the crown of Tanzania. Rising in absolute isolation, at 5895 meters (19,339 feet), Kilimanjaro is Africa’s highest mountain and one of the accessible high summits, a beacon for visitors from all around the world. At 5895, Mount Kilimanjaro is the highest, as well as the youngest, of the three volcanic peaks of East Africa, Mount Kenya 5,199 m and Elgon 4,321m being the other two. Their oldest lava may be only some 1 Million years old, and small-scale activities on the Kibo peak has probably taken place within the last couple of hundred years. 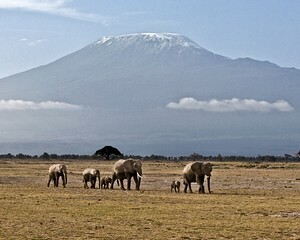 Kilimanjaro is a “Central Vent” type of Volcano, which gives it an oval shape in plain view. The dimension of its base are about 80 x 48 km, elongated in the East – South – East direction. The older rock of its three main peaks are broadly similar, being mainly trach basalts, dark grey rocks containing lighter coloured feldspar crystals. The younger rock of Kibo is, however, of a different composition, and includes nephelirites and nepheline – synites which contain glassy crystals of nepheline. Of the three peaks, Shira to the west at 4006m is the lowest as well as the oldest of them. Its original crater has undergone considerable erosion, leaving only part of the former rim. Mawenzi to the east rises 5149m and has a steep craggy profile, due in part to intensive action of glacial ice. Kibo, the central peak is the youngest and best preserved of the three. Its crater area has a complex structure consisting of a number of more or less concentric features. 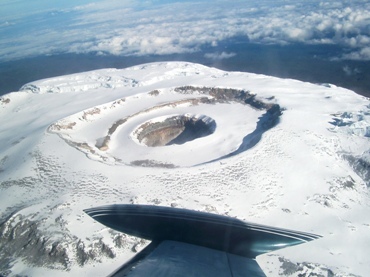 There is an outer caldera not larger than 2.5km in diameter, resulting from an eruption followed by the collapse inwards of part of the summit. The highest point, Uhuru peak is on the southern rim of Kibo Caldera. Within the caldera is an inner cone some 820m cross, which also contains another cone and crater called the Reusch Crater, some 340m in diameter. This is probably the most scenic and most beautiful route to the summit. The 6-day route is however physically more challenging than the Marangu route. The day walks are longer and steeper, however the summit night is one hour shorter. The scenic traverse of the Western Breach offers some stunning views! Only tented accommodation available, which can be less comfortable and will require a good sleeping bag and hiking mattress. This route is one of the shorter but also one of the more difficult routes to reach Uhuru peak–but quiet spectacular. Umbwe is known for its caves. The first night you actually sleep at the Umbwe Cave Camp with two more caves that can be visited on route the following day. Also sometimes used as a descending route. It is a remote, unspoiled and very beautiful route to the Roof of Africa. The forest around the Lemosho Glades is rich in big game animals such as elephant and buffalo, which may sometimes require a game ranger to accompany climbers on the first day. This route is however a long route which requires 7-days for a comfortable completion, which also makes it more expensive. An alternative final ascend route which can be taken from all of the western routes, sleeping at magnificent Arrow Glacier on your summit night. The western Breach poses a very difficult walk up steep scree with some rock scrambling occasionally required. Snow cover makes scree easier but an ice axe is then required. It is also possible to sleep an extra night inside the Kibo Crater.